Hey! How you doing? My gosh, I've been really bad at blogging lately. But before, I really didn't have an excuse... now, I do! 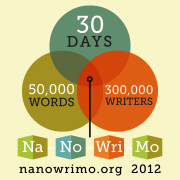 I'm busy taking part in NaNoWriMo! I'm still taking weekends off, but getting 3-5k written from Monday to Friday is working out for me. As of this afternoon, I've written 38,224 words. Which also means I crossed the 100-page mark. Yep. My first draft is officially 101 pages long. So exciting! It's not that exciting for Sierra, because there's so much crap going on in her life I sometimes wonder how the hell she deals with any of it. ;) Yeah, evil writer and all that. I might actually reach 50k by the end of this week (or beginning of next week) which would be great, but it won't be the end for me. I'm going to write like a crazy person all month, and hopefully by the end of it I'll have an 80-90k word first draft for Sierra Fox, Book 4. Fingers crossed.